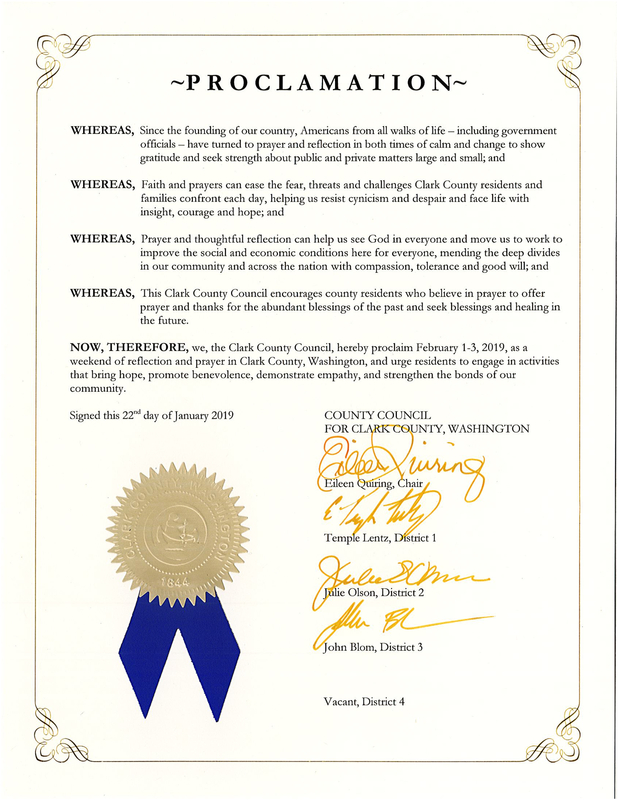 For the 8th consecutive year, the Board of Clark County Councilors have proclaimed a Weekend of Reflection & Prayer for Clark County! Join us on Friday, February 1st at 7pm for a service of worship and prayer at Crown & Anchor Church (11900 NE 95th St, #400, Vancouver) & invite others to come. Plan on reading their proclamation and pray for the county at your worship service this weekend. Download it Here! Following this service, continuing praying throughout the weekend along the following 5 points. Wisdom for each person on the Council (Eileen Quiring, Temple Lentz, Julie Olson, John Blom, and the recently appointed, Gary Medvigy) and each elected official in the County. Pray they would have godly wisdom and be united in meeting the needs of the Citizens of Clark County. Safety for each student in the schools in Clark County. Pray they would be safe physically, emotionally, and spiritually. That they would grow personally and intellectually. Expansion of businesses in Clark County. Pray that the businesses here would flourish and that new entrepreneurs would be attracted here. Pray that the expansion of the economy would help to eliminate all poverty in our county. Protection for each first responder in Clark County. Pray that the police, firemen, EMT’s, and all the support staff would be safe and be effective in their calling. Impact of every congregation and Christian ministry in Clark County. Pray they would help people know Jesus, grow in Jesus and go for Jesus to the places He calls them to. Brought to you by and in collaboration with the . . .